I know... still no sewing or quilting going on. We have so many functions coming up at our house this summer, we're doing projects all the time. 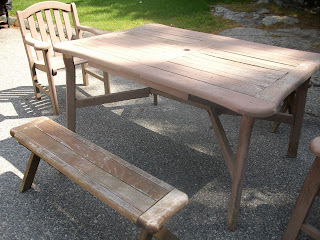 This past week's project was to paint the rockers from the front porch and an old patio set for the back porch. I love to do things fast, so I can be on to the next project. That's why I love spray paint! However, my index finger on my right hand does not like spray paint anymore. Last month I spray painted 40 business sponsor signs for a golf tournament...all the letters and a 2 inch wide border. I think my finger tip is still numb. I could probably do some hand sewing and not need a thimble!! and the oldest patio set you've ever seen. I'm trying to save it one more time. My father thought he was doing me a favor a few years back when he decided to paint it for me. However, it was the ugliest brown you've ever seen. That set stayed on his side of the yard until it faded out!! Now it's mine again. So we'll see how it turns out. and here is what saved my finger. It's a trigger handle that slips over the top of the spray can. Just make sure the hole where the paint comes out is facing out of the opening on the trigger handle. I won't tell you how I know this!! Now you are all set to Spray Away!!! Here's the after picture of the rockers on the front porch. No pictures of the table and chairs yet. They need another coat and I ran out of paint. That dry wood soaked up the paint. I'm also trying to make some cushions for the chairs, but we'll see how that goes. 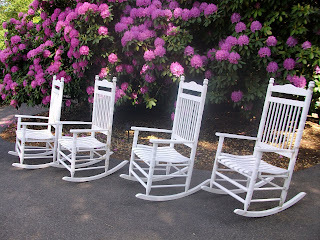 The rocking chairs look lovely. That porch is just gorgeous - lucky you! I bet you all sit out there and just watch the world go by. I'm looking forward to seeing what you did with the patio set. p.s. My word verification right now is 'patio'. How appropriate! You are changing my life, one tip at a time. :) thanks Karen! That handle is great for the spray can. Love your rockers and that porch is beautiful. What a great place to get some hand stitching done! Happy week to you and I look forward to TTT!!!! Beautiful porch.. It just makes you want to be there and sit in your wonderful rockers. They look terrific!! We have the same rockers and they need a paint job too. Do you hire out?? What a gorgeous front porch, Karen! It looks so inviting. And what time will the mint julips be served because I'll be right over! 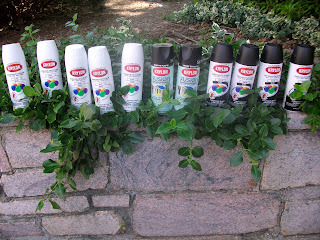 I have no idea why I never think to use spray paint, look at what you did!!! just beautiful!! The chairs look very fresh and inviting--even without cushions. I am looking forward to seeing the table set. Have a great week! Painting my chairs has been on tonight's agenda for a while now. I'd SO much rather quilt! I love your porch. It looks so nice with your rockers on it. I want your porch! So very very inviting. I see that you must have sanded the table etc. It looks like it anyway. I know that I haven't been to the machine to quilt for a bit too. Too cold for me, but we are awaiting warmer weather next week. It must be great just sittin' and rockin' on that porch. I have yet to get rockers for my porch. I think now I'll wait until summer clearance. And with the way retail works, that could be any day. I fear we'll see Christmas in stores soon! Ugh. 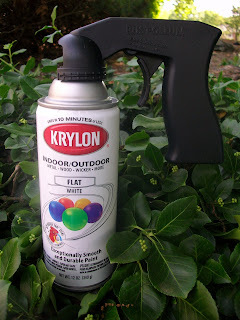 Before I proceed, if receiving a free CAN-GUN1 Aerosol Spray Can Tool, which Totally ELIMINATES SPRAY FINGER NUMBNESS you referred to in this thread offends you, please skip this post! Regarding Karen's 'Spray Away' post about finger tip numbness from using a spray can, I am happy to share with you my new invention called CAN-GUN1 which TOTALLY ELIMINATES this NUMB & FROZEN finger issue forever and... with 800% less effort that the chinese version of the spray can handle that shown in this blog post! My CAN-GUN1 takes only 2.5lbs of grip force to squeeze the FullGrip (All Finger!) trigger to make the spray come out (about the same amount of force as putting the top on a Sharpie pen.) The Rust-Oleum handle in the picture has only a single finger trigger and this handle takes 20lbs, yes, TWENTY POUNDS, OF GRIP FORCE to squeeze the one finger trigger. OUCH! Heck, a regular spray can without a trigger handle attached only takes 7lbs of force, so Rust-Oleum's product actually takes 3x more effort than just using a spray can by itself. Somebody's got some 'splainin' to do! I’m Ken B. and I’m the guy who has just invented, and is now marketing my new product called CAN-GUN1. I’ve been told that our new CAN-GUN1 is: ‘The best thing since the aerosol can” and I’m offering the first 3 folks from the spray paint numbness thread who email me at ken@safeworld.com with their snail mail address (please, one request per address! ), a ‘Free of Charge,’ brand, spankin’ new CAN-GUN1, for their very own! I only ask one thing in return: that you come back to this forum and honestly share your impressions of my new CAN-GUN1. That’s it! I share. You share back. Please, just honest feedback. Thanks! Also, fyi, I'm a the owner of a very small U.S. based family business and, in this economy, I've invested my own money into the development of CAN-GUN1. So, please visit http://www.cangun1.com to see what all the excitement is about. 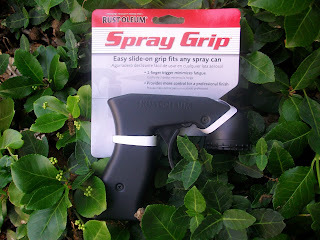 Or do a google search for cangun1.com &/or check out Steve Kruschen, Mr. Gadget's, May 6th tweet on CAN-GUN1 here: https://twitter.com/gadgets4u (scroll down to the bottom and click on 'More') where he said: "Best spray can trigger by a mile. CanGun1. I tried @ the (Nat'l Hardware) show. Worth waiting until available." Well Folks, NOW IT'S AVAILABLE!!! Thanks, and I hope you can join me in pain & numbness free aerosol spraying!